The Hotel Cervo is located in the centre of the famous Porto Cervo in front of the famous Piazzetta, which houses the boutiques of the most prestigious and fashionable names, as well as important craft shops. At night, the pubs of Porto Cervo are crowded by movie and TV stars: this is really the centre of the nightlife in Costa Smeralda. Porto Cervo is very lively during the summer months and during the winter months the boutiques, bars and restaurants in the village are closed. In the heart of the famous Piazzetta, through a flowered arbour, you will be welcomed by a large pool of fresh water. This is just the beginning of how many wonders will amaze you at Cervo Hotel, whose strategic position offers you the privilege of a unique and refined location. 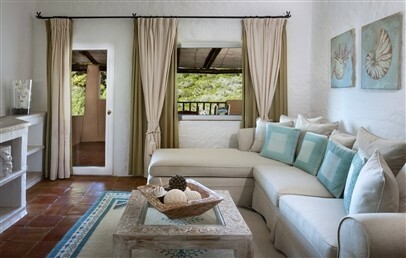 The 80 double rooms and suites are decorated in the typical style of the island, have a balcony or patio and have all the comforts to make the guests’ stay pleasant and unique. Possibility of connecting rooms. The Hotel Cervo has a private beach of white sand (reachable through a shuttle service) and thanks to the Beach Around Program the guests of the Hotel Cervo will have complimentary access to the beaches of the Luxury Collection properties (Cala di Volpe, Romazzino and Pitrizza). A reservation by the Concierge desk of the Cervo Hotel is kindly requested, transfers to/from the properties are not included. The Beach Around Program is a perfect combination with the Lunch- and Dine-Around Program (full board booking necessary). The Cervo Restaurant offers the best recipe from the Mediterranean cuisine, further more, with the full board treatment, Cervo Hotel guests are free to lunch and dine in several restaurants located in Costa Smeralda, thanks to the Lunch- and Dine-Around Program. Breakfast and lunch are with buffet and dinner is with à la carte service. During the winter months breakfast, lunch and dinner are available inside the Cervo Hotel in the cosy winter restaurant. Cervo Hotel proposes different solutions for the entertainment of its guests: a short distance, or, alternatively, one of three beautiful swimming pools for a relaxing moment, tennis courts and golf courses nearby, fitness centre for guests who wants to keep fit. Services available from May to September are the outdoor (not heated) swimming pool and private beach (reachable only through the shuttle boat service. 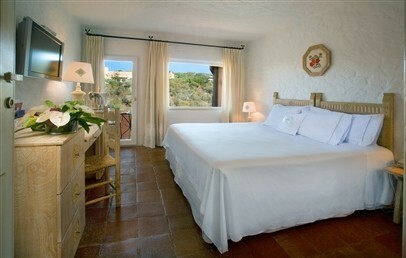 Simple and elegant double bedroom are furnished in Sardinian style with hand crafted furniture and fabrics. 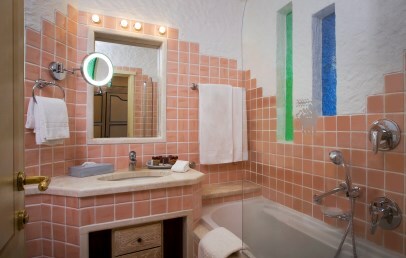 The bathroom is decorated with terracotta tiles and has a tub or shower, hairdryer and bathrobes. 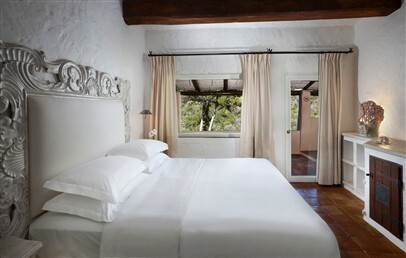 The Superior rooms have a balcony with garden or pool view. 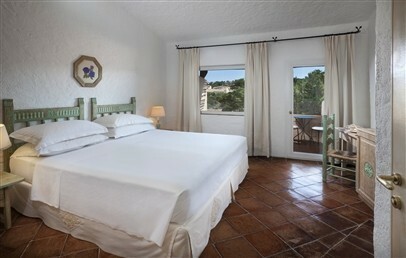 Romantic double bedroom is furnished in Sardinian style with hand crafted furniture and fabrics. 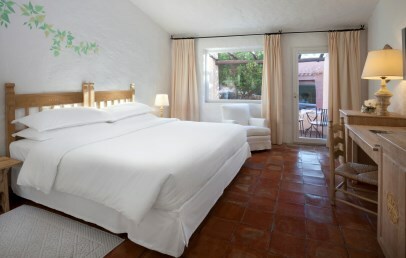 The private bathroom is decorated with terracotta tiles and has a tub or shower, hairdryer and bathrobes. 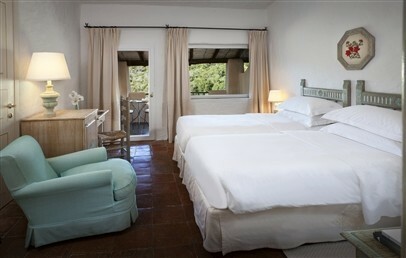 The Premium rooms have a balcony with garden/pool view or sea view. Some rooms have a direct access to the pool. 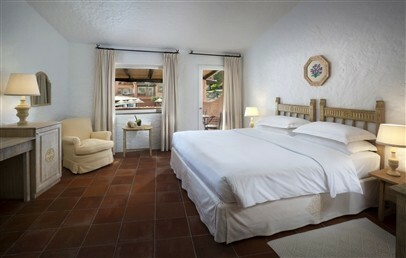 Spacious and comfortable suites furnished in Sardinian style with hand crafted furniture and fabrics. It consists of double bedroom and separate living room. 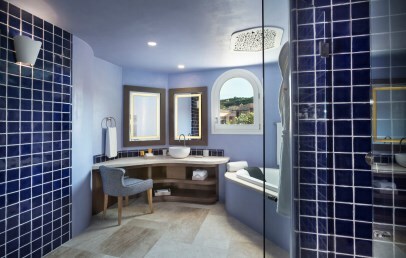 The private bathroom decorated with terracotta tiles with a tub or shower, hairdryer and bathrobes and complimentary toiletries. 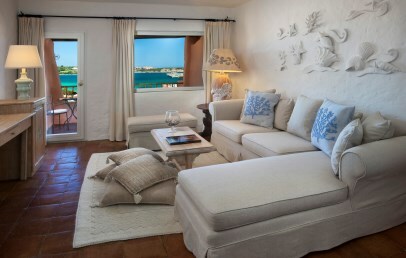 The Deluxe Suite has a lovely balcony or terrace with sea or pool. 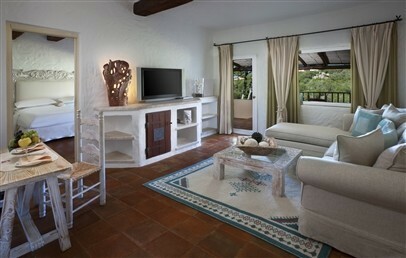 An exclusive, elegant Suite with refined interior and decorative details that reflect the Sardinian tradition. The Premium Suites are located in different areas of the Hotel Cervo and therefore offer different views: sea view and Piazzetta, overlooking the marina or pool view with panoramic view over the sea. The suites provide a night and day zone, some have two bedrooms (on request). The bathroom has either a bathtub or shower and welcome VIP amenities. The balcony is furnished with loungers and table with chairs. 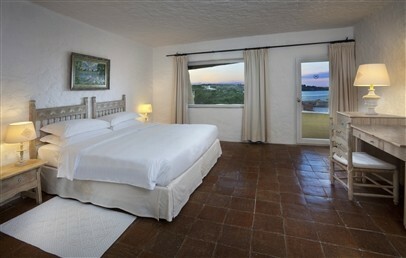 Simple and elegant double bedroom furnished in Sardinian style with hand crafted furniture and fabrics. The bathroom is decorated with terracotta tiles and has a tub/shower, hairdryer and bathrobes. 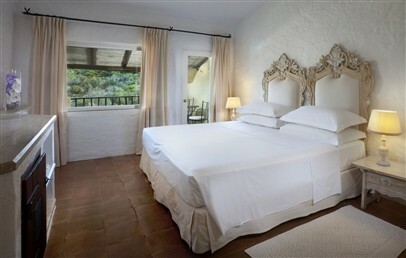 The Classic room are located close to the lobby and to the pool. Some offer a small balcony with garden view and others can be interconnected to another room to give families an ideal solution.